"Many people are aware that they are limiting themselves in some way—perhaps a nagging feeling that they could be appreciating the precious gift of life more fully—yet they also find that, try as they might, they fall back to what is familiar or safe for them. It was not until I had a better understanding of the developmental aspects of the energy cycle in the human organism that I began to be able to help people who are stuck in this way. If our goal is, say, life fulfilment, then the feelings we have along the way are just that: the experience of how it is to be moving toward a goal we are committed to. But if we have been taught not to follow our instinctive and healthy longings, we often settle for a quasi-goal, that of feeling comfortable, perhaps happy. Since feelings are sign posts along the way, or ways of knowing about ourselves and our environment, intuitively and non-linearly, then a feeling cannot be a true goal. To repeat: if we have been frustrated in our natural development in our early upbringing and schooling, we will often settle on a feeling goal, rather than, say, being healthy on all levels. If I take the last as an example, I might go to a doctor to check out some symptoms, the result of which might make me feel extremely uncomfortable, but the commitment to the goal of health makes the uncomfortable feelings secondary to the goal itself. If, on the other hand, I prevaricate on the commitment to health, I’m in danger of just trying to maintain an even keel, which may lead to being in denial about an important matter regarding my health. 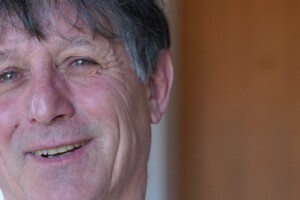 In what follows, I am very much indebted to Jack Painter, Ph.D., who developed the processes of Postural Integration®, Energetic Integration® and Pelvic-Heart Release. 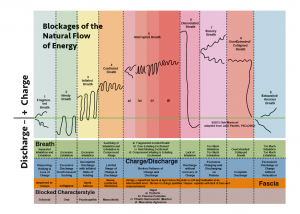 The unblocked energetic cycle in humans starts with equilibrium. In the way it shows up in our breathing, the inhale and exhale are given equal emphasis. The breathing is balanced, full, and easy, and maintains a steady rhythm. When we are in this stage (stage I), we aren’t thinking of getting anywhere, or becoming something, we’re simply establishing our safety and sense of wholeness—our right to exist. In Stage II, once our safety is established, we naturally want to expand. The nourishing breath emphasizes the inhale, while the exhale is very soft and relaxed. If your nasal passages are open, try breathing in through your open mouth, reaching for the nourishment with gently extended lips, relaxed tongue, throat and neck, and breathing out with a soft sound, your mouth gently closed. 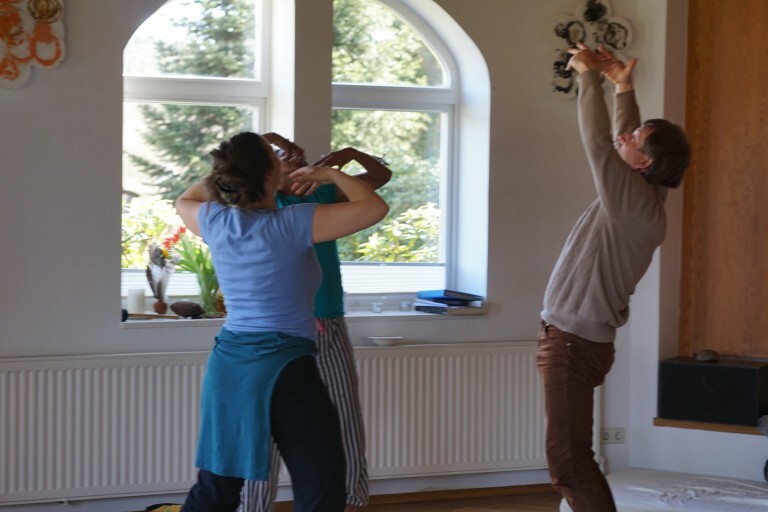 You can imagine the nourishment of the inhale traveling to any part of your body which feels hungry or depleted, aiding such transfer of energy by placing your hand or hands on that part of your body. Once we are filled enough, we begin to want to explore—either our environment or our feelings or thoughts. 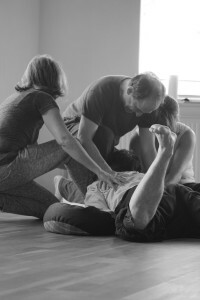 The breath now emphasizes the exhale, and, if your mouth has been closed on the exhale as suggested for Stage II, now open your mouth for the “explore breath” and make a more expressive sound, or even “Wow!” To make the point more obvious, vigorously shake successive parts of your body with each exhale: your right arm, your left arm, your right leg, your left leg, now both your arms, now both your legs, now both your legs and both your arms! Pause a moment after this exercise and feel your body. People often report tingling, pleasant, and more alive sensations in their bodies. The important point here is that, although in one sense, we’ve been emphasizing the discharge—the exhale, with sound and movement while breathing out—overall the energy level is still rising. The next stage is called the free breath, and can be thought of as a combination of stages II and III: we freely breathe in (the nourishing breath), and we freely breathe out (the explore breath). If we think of the inhale as making us bigger, and the exhale as making us smaller, then we can think of the free breath as embodying the freedom to be either big or small, or any size in between. One movement visualization to help with this is to imagine your feet resting on the earth. As you breathe in, spread your arms wide and imagine yourself getting bigger and bigger, and look down and see the earth as a small ball way down there and your body as big as the solar system, or the Milky Way. Then, breathing out, your arms gradually coming back down and you are becoming smaller and tinier; the earth rushes up to meet you, and you are now as small as an ant with the grasses towering above you, the earth infinitely wide, perhaps you have become as small as a molecule. Repeat these movements and visualizations several times. 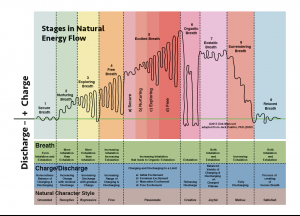 If we were to repeat these four stages, but this time allow each stage to merge into the next, we would discover that our energy is smoothly rising, as though heading toward a climax; and it is precisely what happens in any unblocked organismic energy cycle: the energy builds up, reaches a peak, then returns to the level at which we started. Stage I, therefore, the secure breath, would be returned to, only this time we could recognize that the slow rhythmic breathing would also characterize our need for integration, not just the establishment of our existence and safety. This energy cycle can be thought of in terms of different timescales: a few minutes, a whole lifetime, or mapped onto early childhood developmental stages. Stage I, pre- and peri-natal. Stage II, infancy and oral needs. Stage III, toddlership. Stage IV, around the age of toilet learning. Stage V, not dealt with in this article, is the excitement phase, and heralds the advent of genitality, when the energy of the child is finally anchored in the pelvis. In this stage we repeat the previous four stages—to feel secure in our excitement, to nourish it, to explore it, and be free with it—but at a higher level of energy. Once we understand the normal development of energy in any cycle, the blocks to this flow, at least in terms of breathing, are readily apparent. In stage I, instead of an even inhale, even exhale, the breath becomes chaotic and disorganized or frozen; energy accumulates in the head. In character-analytic or bioenergetic analysis this is labeled the schizoid block. The stage II block is described as follows: just when we need to be emphasizing our inhale, we emphasize our exhale. This is the depleted breath. Sometimes it takes the form of endless talking (endless exhale! ), or repeated sighing. The stage III block corresponds to the toddler who is suddenly not allowed to be little anymore. He has to stay inflated; he’d better watch out and not fall down and cry and be needy. So the exhale is inhibited just when greater expression is needed. If someone with this block lies down, you will see that the ribcage will be permanently raised, most noticeably around the diaphragm. The stage IV block will be a combination of the previous two: neither is a full inspiration, nor a full exhalation allowed. Life is constricted to a narrow band, resulting in a thickening and a density, both physically and emotionally. Now we are in a position to answer the problem posed at the outset of this article. A person who has “made it” to stage IV and exhibits this limitation in the blocked form—some compression and constriction—will also have the capacity to organize their life effectively enough to have gotten ahead with succeeding at quite a few of the demands which our culture seems to impose on us: getting a job, buying a car, etc., etc. A crisis of midlife, kids leaving home, a parent dying, an “unexpected” divorce, a physical illness, sudden unexplained difficulties with coworkers—something like these events may penetrate the compression and unleash very scary feelings which were buried for many years. It is as though the lack of a complete inhale, and an inhibition of a thorough exhale—the respiratory equivalent of compression—have conspired to create a thick wall of ice upon which the person’s conscious self resides, but now the hot processes of life itself have caused the ice to become precariously thin at some places, completely thawed through in others, and the person’s sense of self becomes in danger of fragmenting. For reasons of safety, the unconscious defense processes will want to reestablish the old familiar ice, but there is something none of us can resist in the end: the force of life is stronger than we are, and, though it can be terrifying, we do better when our conscious selves decide to risk going along with the life force, or, at least, not trying to fight it. To put this in developmental terms, remember that stage IV, the free breath, corresponds to around two years old. By then we will have developed a minimal capacity to think for ourselves and some minor independence, at least psychologically. If our still earlier life experiences have been anything like what was considered normal in terms of Western child-rearing practices until very recently, then those years from birth to two years old will have been marked with many experiences of overwhelming disappointment, whose pain we can only indirectly experience. This is why it can be so hard for us to move beyond a life of quiet efficiency and endurance and allow life to come at us though the cracks: in order to breathe more deeply so that our life can be appreciated more fully, we need to be prepared to deal with feelings which may shock us in their intensity. And, worse still, once we begin to thaw out, we not only feel the gratitude of finally coming to a greater sense of flow—which we yearn for—we also discover that our reassuring previous life of endurance, compression, and block has become mere icebergs on a thawed-out sea which can now experience, horror of horrors, the inevitable changes in weather which come from living in the ocean of life. But there is a saving grace in all of this: as our defenses melt, and the tight holdings near our center begin to soften, we become deeply united with life once again. No matter how rough or becalmed the surface waters of our feelings become, in the depth of our core the steady forces of creation and wholeness beat with a rhythm of peace and connection.